Actually, although it’s April it wasn’t showering yesterday – which is a good thing, because look what I found when I went out for a walk! OK, OK… I know I can’t fool you all that easily – especially not any of my dozen or so faithful readers who are by now bored rigid by photos of this shawl in progress. So – might as well get right down to the specs. Introducing: April Showers, in all her finery!!! 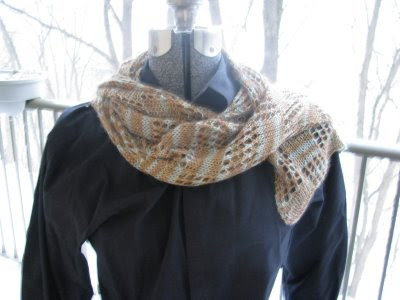 … and was dying to knit the Hanami but couldn’t face any more basketweave for a while. One day I will knit the pattern as written though – I love it, especially the seeming randomness of the cherry blossoms/droplets. Yarn: Fleece Artist Italian Silk, in the Rainforest colourway. I used the better part of two skeins (each skein has 115 g and 350 m). Beads: clear seed beads from Arton in Toronto – approx. 650 (I lost count). – I am very challenged mathematically and so it took some time for me to figure out how to go about this. I ended up changing gears somewhat halfway through as the yarn actually grew much faster than I had thought! (a) I strung on approximately 200 beads to start. I used these for the border only. All the other beads were put on as I went with a .75mm crochet hook. (There is a very useful tutorial on how to work with beads here). (b) I then cast on 20 stitches (the 16 stitch repeat plus two at each end for a garter stitch border). I used the beaded cast-on as per the pattern. (c) Throughout the project I did a beaded edging by inserting one of the beads I’d strung in between the two first stitches and the two last stitches on every right-side row. (d) I started the pattern from the bottom/end (Chart G) and did 32 rows each of Charts G, F, E, D, and C in that order, then the first 4 rows of Chart B. That’s when I started to run low on yarn and had to pack it in. RS: K1, place bead, K1, M1 … [pattern to last 3] … M1, K1, place bead, K1. WS: K1, place bead, K1, M1P … [pattern to last 3] … M1P, K1, place bead, K1. However, by the time I finished Chart E (again, going backwards) I realised the shawl was growing a bit too disproportionately horizontally. 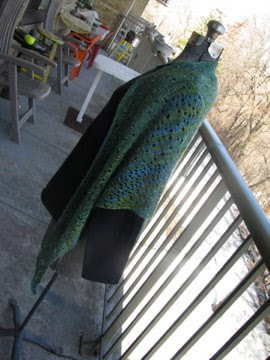 For the rest of the shawl, until the last 4 rows, I only used the increase sequence on the RS. In the last four rows for some reason unknown to me, I reverted to increasing two every row as above. I’m not sure if this resulted in the little pointy ends or not – that was not planned, nor was the downward curve of the edges. But we’ll just call that a little design feature, shall we? (f) At the same point that I stopped increasing every row, I switched to the 3.75mm needles. This was primarily a practical call as my 3.5mm needles have a far shorter cable. I suspect, however, that that resulted in part in the little pointy ends – the top part stretched more during blocking. 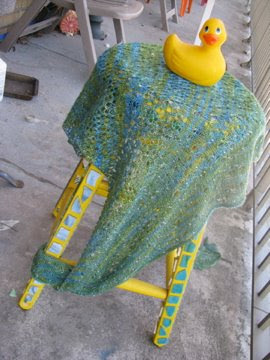 (g) I started placing beads again at Chart E (74 rows in) – I wanted to create an effect of raindrops hanging in the air. At first I placed them more or less at ramdom where there was space. Later in the pattern, when the spaces between the yarnovers grew larger, I placed one or two beads in each 16-row sequence on both RS and WS, depending on where the plain stockinette spaces were. Oh – thanks to Amy, by the way, for giving me the idea to use clear beads. I like the effect! Well, that’s more than about enough design blather from me for now, I should think. Except to say that the shawl is apparently a hit with the Brouhaha household. Hey, even my harshest critic seems delighted! Pingback: summer clothing! « Bespoke By Brouhaha!